Mohabat Maqbara is historic place of attraction in Gujarat and is mainly known for its splendid domes, towering minarets and arches. Every year tourists from India and around the world come here to see this outstanding specimen of architectural craftsmanship of nineteenth century India which forms the major center piece of attraction in the state. The architecture of this monument represents the perfect fusion of Indo-European-Islamic styles whose appeal is still intact before the visitors all over the world. Each and every corner of this monument bears the testimony of the aristocratic taste and lifestyles of the Junagadh rulers. This historic monument comprises of two complexes and its portals had been ornamented with silver which is worth to watch. 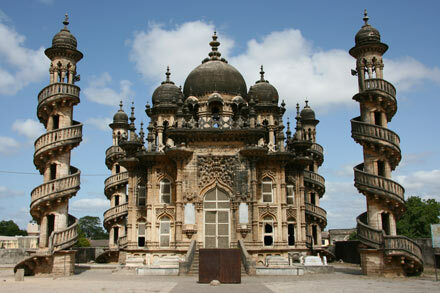 This monument comprises of overall four minarets with intricately designed spiral staircases. Each minaret comprises of large doors of silver along with exquisite stone carvings. The construction of this monument had begun in the year of 1878 under the supervision of Mahabat Khanji which was completed by his descendant Bahadur Khanji in the year of 1892. 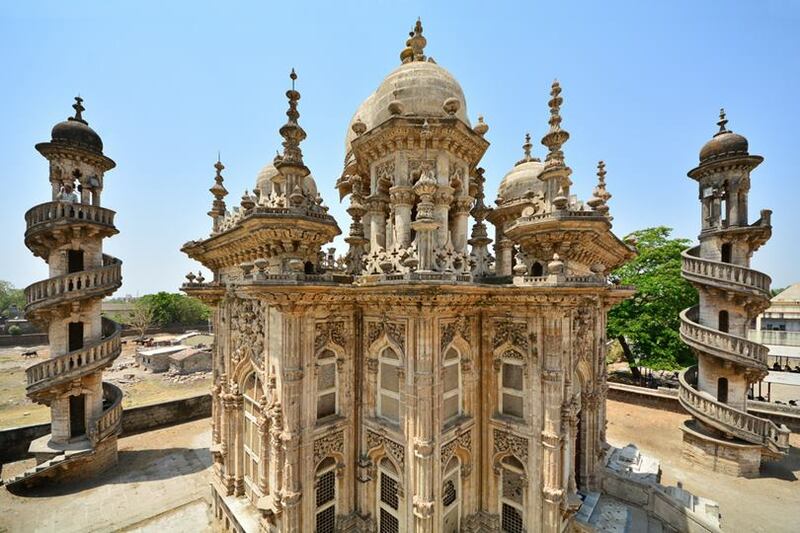 This landmark monument was come up in the old town of Junagadh which was previously existed like a secluded spot.This old town of the city dates back to the period of nineteenth and twentieth century during the time of British rule in the country. 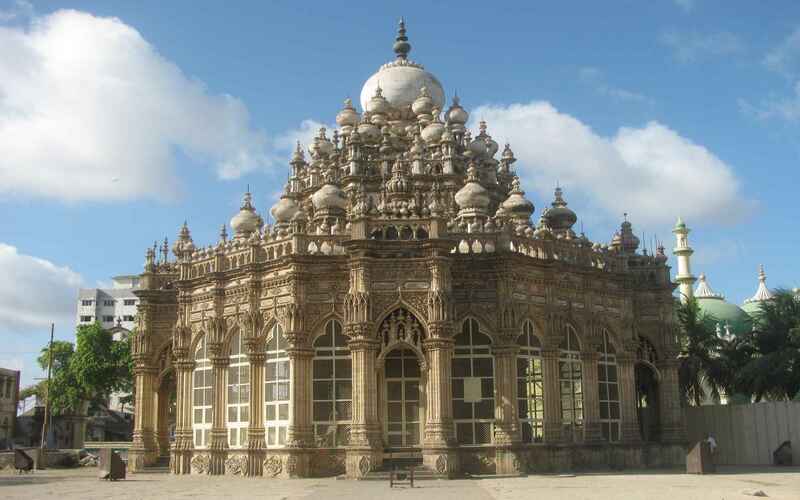 The Bahauddin Maqbara inside this monument was built by Sheikh Bahauddin during the time span of 1891 to 1896. The monument also shares its association with the renowned tales of the 1001 nights. At the time of partition, Mahabat Khan III fled to Pakistan and with the unification of Junagadh the task of managing the monument fell into the hand of Indian government. Inside this monument lies the tomb of Mahabat Khan and so it is often considered to be the Taj Mahal of Gujarat. Adjacent to this mausoleum, the Jama Masjid is situated and tourists have the chance to visit other eighteenth century mausoleums that were constructed by the Junagadh nawabs. This monument is also referred to as Mosque of Bahaduddinbhai Hasainbhai as it also houses the tomb of Sheikh Bahauddin. This landmark monument is situated adjacent to Girnar Hills of Junagadh district of Saurashtra in Gujarat. It will approximately take about 327 km by road from Ahmedabad to reach the old city of Junagadh to see this marvelous piece of wonder. By rail it will roughly take about 2.5 hours through Veraval-Rajkot line. The favorable time to visit this popular place of attraction is from October to April when the atmosphere is pretty cool and comfortable.